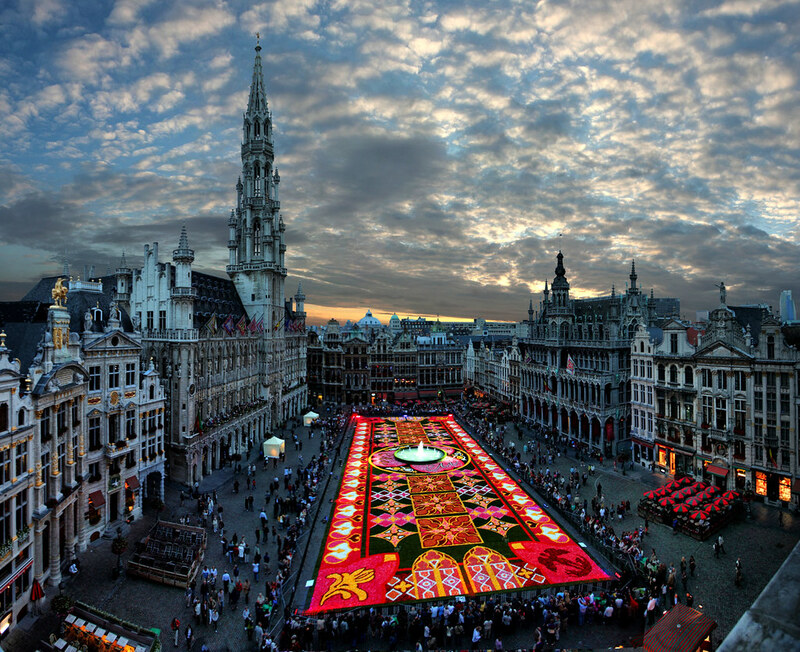 The first Brussels flower carpet took place in 1971 on the Grand-Place by the landscape architect E. Stautemans. Since then there have been 18 flower carpets and they have appeared every other year since 1986. The main component of every carpet is the begonia. A native of the West Indies and cultivated almost exclusively in the Ghent area since 1860, Belgium cultivates 60 million begonia tubers every year and is recognized as the world’s largest producer. The flower carpet above, breathtakingly captured by Gaston Batistini, is from 2010. The theme was ‘Europe’ and honoured the Belgian presidency of the European Union. On two opposite corners is the image of Saint Michael striking down the dragon. This is the protective image of the city of Brussels which was founded over 1,000 years ago. On the other two corners is the stylised image of the yellow and blue iris, the emblem of the region. Between the two, there is an evocation of Gothic architecture representing the splendid surrounding buildings. In the very centre, at three different angles, the EU logo is displayed.